Oceanographers have completed an important step in constructing the first deep-sea observatory off the continental United States. 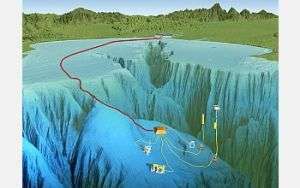 Workers in the multi-institution effort laid 32 miles (52 kilometers) of cable along the Monterey Bay sea floor that will provide electrical power to scientific instruments, video cameras, and robots 3,000 feet (900 meters) below the ocean surface. The link will also carry data from the instruments back to shore, for use by scientists and engineers from around the world. The Monterey Accelerated Research System (MARS) observatory, due to be completed later this year, will provide ocean scientists with 24-hour-a-day access to instruments and experiments in the deep sea. The project is managed by the Monterey Bay Aquarium Research Institute (MBARI) and funded by the National Science Foundation. Currently, almost all oceanographic instruments in the deep sea rely on batteries for power and store their data on hard disks or memory chips until they are brought back to the surface. With a continuous and uninterrupted power supply, instruments attached to the MARS observatory could remain on the sea floor for months or years. "MARS represents the first step in a long-planned process to transform the way the oceans are studied," said Julie Morris, director of NSF's Division of Ocean Sciences. "Marine scientists will no longer be required to go out to the ocean for their studies. The ocean is about to come into their offices." If something goes wrong with the instruments, scientists will know immediately, and will be able to recover or reprogram them as necessary. Slightly thicker than a garden hose, the MARS cable is buried about 3 feet below the sea floor along most of its route, so it will not be disturbed by boat anchors or fishing gear. The cable itself contains a copper electrical conductor and strands of optical fiber. The copper conductor will transmit up to 10 kilowatts of power from a shore station at Moss Landing, Calif., to instruments on the sea floor. The optical fiber will carry up to 2 gigabits per second of data from these instruments back to researchers on shore, allowing scientists to monitor and control instruments 24 hours a day, and to have an unprecedented view of how environmental conditions in the deep sea change over time. "After 5 years of hard work, we are thrilled to bring the age of the Internet to the deep ocean, so we can understand, appreciate and protect the two-thirds of our planet that lies under the sea," said MBARI director Marcia McNutt. "We are grateful for the help of our talented partners and visionary sponsors. MARS has truly been a team effort." At the seaward end of the MARS cable is a large steel frame about 4 feet (1.2 meters) tall and 15 feet (4.6 meters) on each side. This "trawl-resistant frame" will protect the electronic "guts" of the MARS observatory, which will serve as a computer network hub and electrical substation in the deep sea. The researchers hope to install these electronic components into the trawl-resistant frame in the fall of 2007. After the electronics package is installed and tested, scientists from around the world will be able to attach their instruments to the observatory using underwater extension cords. These instruments will be carried down from the surface and plugged into the science node using MBARI's remotely operated vehicles. MARS also will serve as a testing ground for technology that will be used on more ambitious deep-sea observatories. As planned, such observatories will use thousands of kilometers of undersea cables to hook up dozens of seismographs and oceanographic monitoring stations. They will provide scientists with new views of sea floor life, and a new understanding of the global tectonic processes that spawn earthquakes and tsunamis. "MARS is the harbinger of an international ocean observatory network that will enable scientists to study ocean features and changing conditions," said Morris. "New ocean observing capabilities will provide knowledge about the ocean, and information to better manage and preserve ocean resources." The MARS project was initiated in 2002 with $8 million in grants from the National Science Foundation (NSF) and $1.75 million from the David and Lucille Packard Foundation. NSF also contributed an additional $2 million to meet permitting and homeland security requirements. Components for the observatory are being designed and built by MBARI, the University of Washington, Woods Hole Oceanographic Institution, Nautronics Maripro, and Alcatel.